Overview: Opera Next gives you a sneak preview of what's to come in future versions of Opera. Advanced users have the chance to test out exciting new features that are still under development for the next release of Opera Mini – and provide feedback on how to make it even better. Opera Next gives you a sneak preview of what's to come in future versions of Opera. Advanced users have the chance to test out exciting new features that are still under development for the next release of Opera Mini – and provide feedback on how to make it even better. 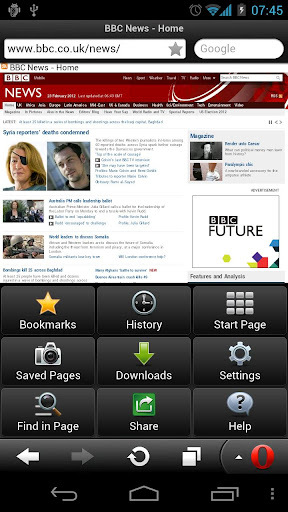 Opera Mini Next is not intended for everyday browsing. If you're looking for the current final release of Opera Mini, click here: http://bit.ly/opera-mini-android . Once you download Opera Mini Next, you will see a white “O” icon instead of the normal red Opera “O”. Since it is a separate version, no changes will be made to your original Opera Mini installation. Read more about Opera Mini Next here: http://opera.com/mobile/next/. We want to know what you think! To report a bug or make suggestions, please use our Bug Report Wizard (http://mini.bugs.opera.com/) or the user forums (http://my.opera.com/community/forums/forum.dml?id=111 ).